To encourage and support more manufacturers and suppliers into the sport is only good thing. So please take couple of minutes (it won’t take 10) to complete this company’s survey. Acceptable weather conditions, with a good dose of sunshine by late morning, blessed our 2019 Back to the Water Day. The 30 or so participants were treated to a session of core first thing – a good wake-up stretch from Nigel. After that, Nigel explained how the rest of the morning would proceed and attendees were split into groups, largely according to speed. The most leisurely was Dom with little 2-year-old Peter in a Canadian Canoe. There was in-depth technique from our master-guru on this, Andy Rawson. Nigel and Phoebe took out the youngest members, the Under 10s full of energy and enthusiasm. Brian and Jan put the Divs 7-9 through their paces, Jim took the Divs 4-5 and Immi the speed merchant Divs 1-3. Judging by efforts going on in front of the club, it was hard work. There were plenty of cakes to top up energy levels and a quick talk through racing objectives for the year. For those who stayed for the afternoon’s fun, there was K1, K2 and K4 time trials around De Montfort … all ready for the first time trial on the following Monday. Big thanks to all coaches for encouraging us all back to the water and to Nigel for all his organisation. 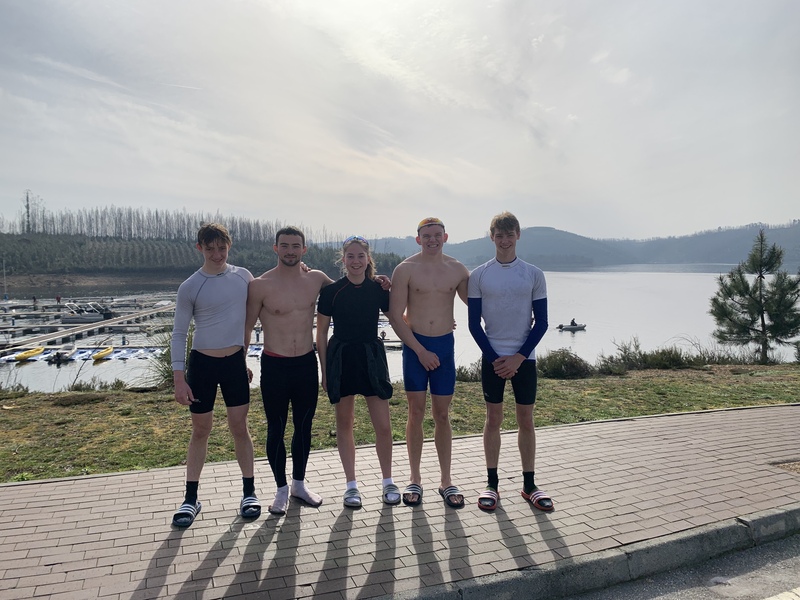 Over half term, three of our Highdown Paddlers – Freddie Kemp in Year 13, Sam Betts and Alex Tonkins, both Year 11 – were out in Portugal for a week of intensive training with the national squads. Here they are pictured with two other Reading Canoe Club juniors, who were also out there. We are still taking entries. To guarantee your entry you need to have checked out form the online entry system and made payment before entries close. Currently we plan to take entries up 16-Mar-19 @ 14:00, however, if we experience higher than normal numbers we could close entry early so please do not delay. As you are probably aware the river is on yellow boards and we are experiencing high winds. Consequently there may need to be some degree of special measures in place for Thameside 2. Please keep an eye on the Reading Canoe Club website for further updates. -Support crews: Use A4155 and avoid Reading town centre. When you finish at Longridge, please use the changing rooms provided. Do not change in the car park. T1 – It was great, if a little wet! Thank you to everyone who supported the race both on and off the water. We have been pretty spoilt in recent years with the weather so we due a wet one. Thankfully the wind didn’t arrive. Results were streamed during the race here, let me know if you see any errors. Lost Keys – The set of keys that were found at County lock have been handed in to Reading Police station. We are no longer taking new entries for Thameside 1. We are still allowing the few individuals that have not completed the check out process to do so, however, please do not delay. You will not be able to get your race number without completing check out and paying. We have already received a good number of entries for Thameside 1, therefore it is highly likely that we will close entries ahead of the Saturday 14:00 deadline. Please do not delay entering (& paying)!